My husband is a smoker...not the cigarette or funny kind (don't worry mom) but a meat smoker. He's smoked everything from baby back ribs, to briskets, to whole legs of pork. So it was only natural, when he was looking to upgrade, that he bought a Big Green Egg. Known for being the Cadillac of smokers they are perfect for low heat, long period cooking. Recently though we've been using ours to do some high heat cooking; baking bread and pizzas, roasting bell peppers and grilling baguettes to be used for bruschetta. 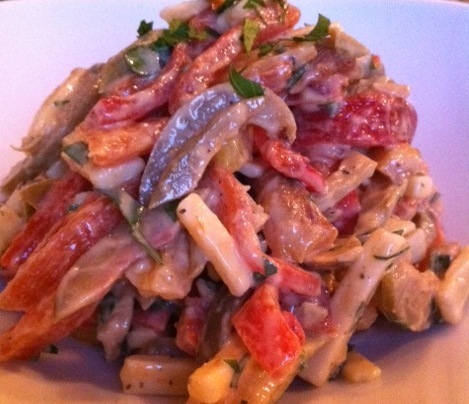 The recipe below is for a classic Lidia Bastianich Northern Italian salad. We grilled up the components on our Big Green Egg and turned this delightful dish into the perfect bruschetta topping. Toss peppers, cheese and olives together in a bowl. Whisk together the cream, mustard, vinegar and salt in a small bowl; whisk in the olive oil gradually until the dressing is emulsified. Pour dressing over the salad; toss to coat. Let salad sit at room temperature so flavors blend, 15 minutes. Sprinkle with parsley. Serve in a bowl with grilled baguette slices. The salad may be assembled and dressed an hour in advance and refrigerated. Let sit at room temperature before tossing with parsley and serving. I've always wondered about smoking your own meats...I've never done it before or known anyone to do it. I would love to learn more about it! My husband wants a Big Green Egg SO badly! Is it worth the money? This is lovely - I have roasted a ton of peppers this week and would like to try this - maybe without the cream. That bruscheetta sounds AMAZING. Forget about the baguettes, I'd probably just eat it straight from the bowl! I've missed visiting! I'm so glad my arm is healing and I can type again. This looks so good (as always) and I'm already hungry again even though I just finished breakfast. Much love and many blessings from Austin!